Survival. It’s popular, it’s time-consuming and it’s everywhere. This being the case, it can be hard to stand out from the crowd and deliver a solid gaming experience all at the same time. We’ve taken a look at early-access title Outpost Zero, from Symmetric Games and publisher TinyBuild, to see how it’s shaping up. Outpost Zero drops you into its world quite literally, sending you crashing down upon a dusty planet’s surface, there to spend the rest of your robotic existence. You belong to a corporation preparing the planet for human colonisation, but hey, it’s a free market out there — in PvP, you share the space with other corporations’ robots, all eager to claw out their own share of the spoils. Being in early access, the tutorial and general discoverability of new tools and features is rather slim at the moment, although there’s a twenty-minute quick-start video you can watch for pointers. As it is, the tutorial UI flickers in and out of existence, offering you a series of recommended tasks and repeating itself every time you respawn after death (you can just skip it, in that case). Still, it’s a useful base to build from. The weird demon-deer are completely harmless, but they make good fuel. Trees, however, do not run away. As with all survival games, you don’t start out with much — in fact, your drop pod explodes soon after landing — so you have to bring a few resources together before you can properly set out. This is your introduction to the wildlife, otherwise known as fuel. There isn’t a massive variety of flora and fauna, but the planet Gaiya (yes, spelt like that) hasn’t seen the terraforming touch just yet. So get wild with your handy tool and decimate the locals for sweet, sweet carbon as you go off on a search for iron and other materials to start building. 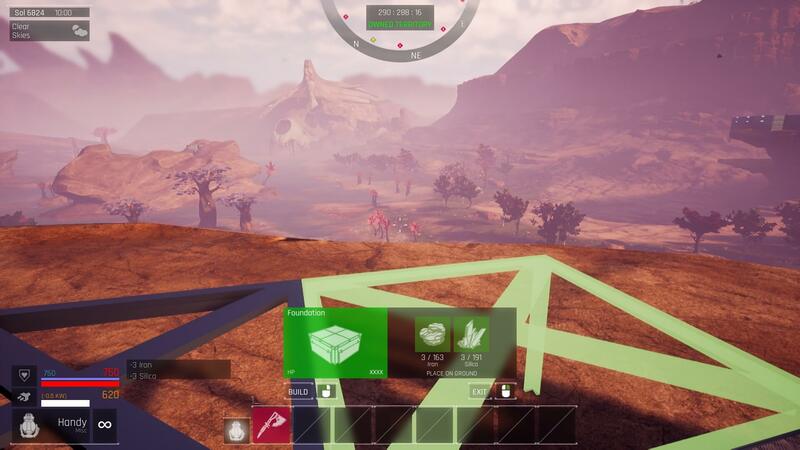 Of course, different tools are better suited for different jobs, so whilst the handy tool is more effective for iron nodes, you’ll want to use an axe (your only other starting tool) to cut down trees. Building is mercifully simple. You scroll through some component menus before selecting a piece, moving to a good spot and using your handy tool to place a framework. What’s different from other survival titles is that this is only a frame at the moment. You have to click and hold with your handy tool to continue building it — or just make use of your drone companion. At least you get a good view while you build — like this worryingly large skeleton, for instance. You begin the game with one drone, but there’s an emphasis on building up a workforce of them (not that the materials to produce them are easy to come by). Standard drones can help with building, gathering and crafting, amongst other tasks, and you can also build specialised combat drones to follow you or patrol an area. You’ve got to remember that you’re a robot. You run on a limited source of power and don’t heal naturally. If you get damaged, you have to use a health pack (or, well, die and respawn). If you get low on juice, you have to recharge. This requires a power source. Gaiya is filled with energy rocks you can recharge at, but this won’t recharge your drones or power your base. To do that, you can build a variety of generators, starting with the simplest steam furnace, which is powered by carbon. Pylons can transport this over longer distances and batteries can (supposedly) store the power for later use. 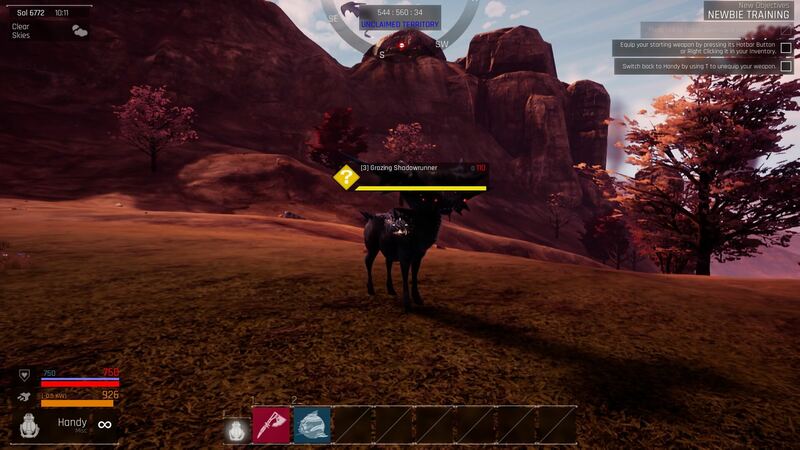 If you haven’t been obliterated by players yet or you’re not on a PvP server, this is when you come up against your first real enemy (not counting the extremely fast and deadly native wildlife). Every now and then, pirates drop from the sky to attack your base. These aren’t too difficult to begin with, but later on when your corporation is worth more, the attacks can get deadly. The AI isn’t quite honed yet, and we lost three pirates in the middle of a lake for about half an hour before they mysteriously died, which was more amusing than anything. It’s a good idea to make sure you’re always charged and ready for an attack in Outpost Zero. 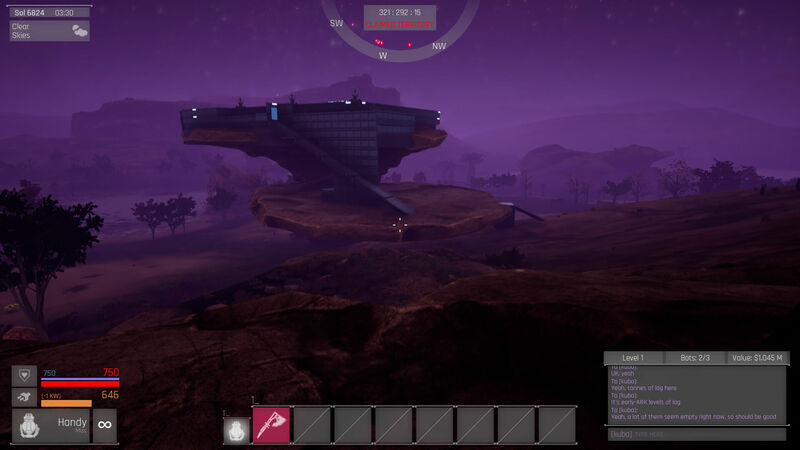 To build and craft more useful materials (including higher-tier armour and weapons, which has seen a recent rebalance), you’re going to have to do a bit more gathering, either ranging far across the map for resources or building your base in a location that happens to be near most of the stuff you need. (One end of the map generally contains more, higher-level resources than the other.) Even at the lower tiers, though, we’d be tempted to say some resource costs are a little too high or hard to get, especially when it comes to the materials to create drones. To take some of the tedium away, you can build and power resource collectors. This is a welcome feature, as while the handy tool does have an on/off toggle, switching it on to blat away at an iron node while you go away to make a cup of tea isn’t exactly the most thrilling experience. There isn’t much variety across the map’s landscape yet (it’s a series of valleys with lakes winding through them), but it’s worth paying attention to which map square you’re in. Natural events occur in certain areas occasionally, from sandstorms to cold snaps and meteor showers. Either hike out of the area or get indoors, and make sure you have a drone standing by to repair any damage. If the sky’s a pretty green, don’t stand outside looking at it… much. That and higher-tier crafting is all there is to singleplayer Outpost Zero at the moment, but what about when other players get involved? We tried PvE for a while, but barely anyone was on the servers, so instead we joined another player’s corporation on a PvP server to see how things were. There was a wary (but amicable) atmosphere on the server, so finding someone to team up with took a few minutes — trust in other players was likened to Rust levels of harmony. At the moment, there doesn’t seem to be a great deal of online combat. We came into conflict once, but severe lag put a bit of a damper on it. No, the majority of attacks against your base and bots happen whilst you’re offline, which is why it’s important to have turrets or build in a hard-to-reach location. We used the latter tactic, as turrets are apparently impossible to keep powered whilst offline, but the base could still be attacked with rocket launchers from a distance. Is there much point to PvP at the moment? Not really, apart from to set people back and keep competition for resources down. 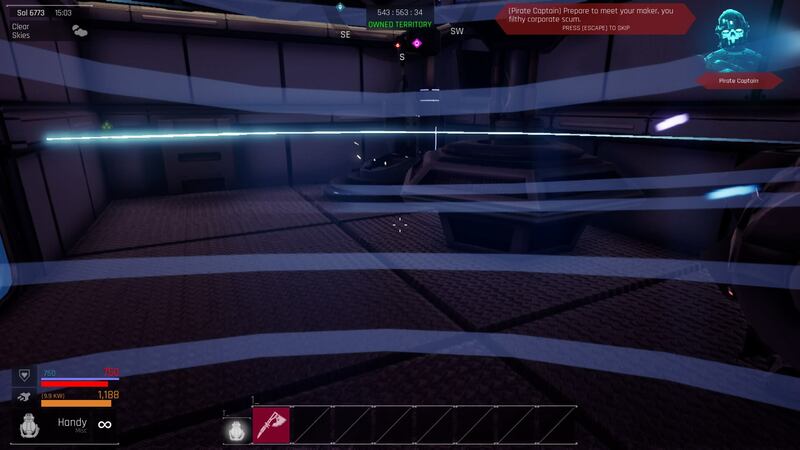 The main goal behind PvP will come when terrain claimers are properly implemented, which means you can take out someone’s command centre and claim the base as your own. This could be an interesting means of reducing ‘collateral damage’, if the focus of raids is acquiring rather than destroying as much as possible. Some brief reconnaissance revealed our neighbours had quite the base. Ours was similar, but we deleted the ramps when we logged off, making it (theoretically, but not actually) unreachable. PvE has a couple of problems. One is the sheer density of buildings that can’t be destroyed. Because of how far bases have to stretch to power resources, it can be a stretch to find any unclaimed territory to build in. We ran for what seemed like miles on one server without coming across any space. If the PvE servers were more populated, this issue might be reduced by people working together more — but we’ll see. There are also issues with turrets automatically expending all their ammunition on anything living within range, even non-hostile wildlife (and PvE players, which is a concept intended to deter griefers…). At the moment, it’s easy to feel directionless playing Outpost Zero — and we think that’s partly because it’s missing its crowning touch. When you first open up the game, a cutscene shows you a ship heading to Gaiya carrying a human foetus. 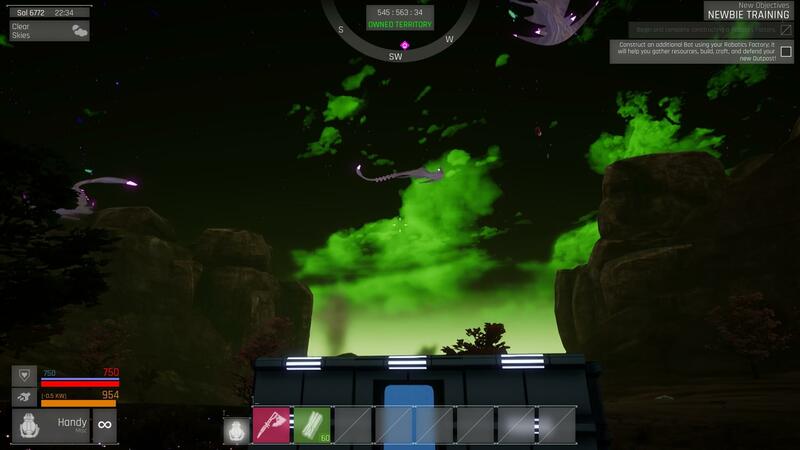 According to the developers, ‘It’s a sneak peek to the future of the game lore, where humans will come from Earth to inhabit the colony you prepare for them — and bring a lot more new types of conflicts with them’. Along with plans for big pirate bases to attack, this will flush Outpost Zero with fresh things to do. Building a living, breathing colony as part of a survival game is, perhaps, a unique promise and one we look forwards to seeing fulfilled. If Outpost Zero takes the time to harden its current concept, improving on principles such as balance and overall user experience (especially when it comes to power management), it’ll be a solid new experience when it comes to its final stages. Outpost Zero is available for PC through Steam early access.